Surrounded by others exploring what it means to live into a life of faith, Confirmation Camp at Green Lake Bible Camp can be a transforming extension of the ministry happening within your home congregation. Join us for a week of fun-filled faith formation in the vibrant setting of camp! You will get the chance to swim, boat, explore the woods, play large group games, sing and do crafts! This is a great time for church staff to build relationships and engage youth from their congregation on the shores of Green Lake. Confirmation has never been this much fun! 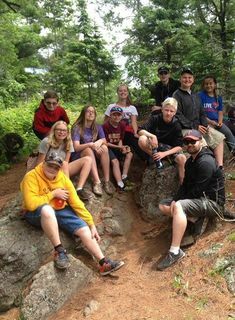 You'll spend a week in the Minnesota North woods with your confirmation class and your pastor exploring the great outdoors and what it means to be a faithful child of God. You'll learn a variety of new skills like paddle boarding, brick over cooking, and enjoying a genuine Finnish sauna. We will also enjoy a trip to Gooseberry Falls State Park and Lake Superior! Sign up for this program through your church. GLLM offers transportation to Camp House for this great week. ​Adventure awaits you as part of our Homestead program. Without running water or electricity, Homestead is our most rustic program, but also one of the most loved. Alongside trained guides, campers will receive training in the areas of canoeing, fire-starting, outdoor cooking, orienteering, shelter building, and environmental science. Whether lighting a fire to cook on, or igniting your faith through guided study and worship, Homestead is the place to be! This is the ultimate summer program for Middle School and Senior High youth. It combines a service component with a high adventure experience on Lake Superior's North Shore. You'll visit and work in a soup kitchen, clothes closet and food shelf two days of the week. The other two days will be spent on the Superior Hiking Trail and Duluth's Lester River Park where you'll be able to go mountain biking and sea kayaking on Lake Superior. It's an awesome experience! There are three weeks of this program--two for Middle School and one for High School aged youth. You can sign up as a group or individually. Chaperones are also welcome!! GLLM offers transportation for this program. If staying up late and sleeping in sounds like it may be a schedule that fits you better, the Stargazer program is right for you! As a Stargazer, you'll get a chance to do all the exciting camp things -- swimming, boating, crafts, singing, Bible study, making friends, etc.-- but on an altered schedule! This camp begins about 10AM and runs until 1AM giving campers a chance to sleep late, play night games, and see all the things normal day dwellers miss.